Yesterday evening and this morning, I watched Trekkies and Trekkies 2, a pair of documentaries about Star Trek fans hosted and produced by Denise Crosby. I'm not a big Trek fan myself, but I have seen most, if not all, of the shows produced prior to around 1996. (I think I stopped paying attention after the first season of Voyager.) I watched the two documentaries primarily out of an interest in fandom. My preference is obviously for comic fandom, but there's an appreciable overlap with science fiction. Both were interesting in that, myself not being a Trek fan but still reasonably knowledgeable about the shows, I was able to pick out a lot of the direct and immediate parallels with comic fandom. 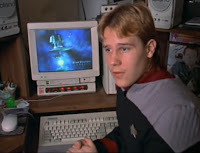 Watching the clips in Trekkies of Gabriel Köerner, for example, I saw a lot of my 15-year-old self in him. He was making a deliberate attempt to come across as serious and intelligent -- which he certainly was, but it came across as fairly labored in that way that teenagers sometimes try to act more adult than they are. Trekkies 2 was able to follow up with him several years later and, very much to his credit, he totally owns his depiction in the earlier film, going so far as to call himself "socially oblivious" in it. Which was very much who I was in high school. Comics instead of Star Trek, but pretty much the same. Including the mullet. What I liked about the overall format of the two movies was that it provides a number of very honest vignettes. Some people were in costume, some weren't. Some people took it more seriously than others. Yeah, there were some stories about folks who didn't seem to have an entirely solid grasp on reality, but by and large, everybody was presented as simply, "This is who this person is." And the added talks with fans' family and co-workers provided some interesting perspectives. I also liked that most of the fans were very clear on why they liked Star Trek specifically. They were able to articulate what about the premise they found appealing. I don't see as much of that in comicdom. Comic fans can often, I think, describe why they like Superman over Batman, or Marvel over DC, but I don't see/hear much about why they like the medium as a whole. What I would've liked to have seen more of is more professional analysis. How does dressing up as a Bajoran help someone deal with contemporary society? What does someone get out of learning to speak Klingon? They even had one fan who was a therapist, but he only spoke in very broad terms about what people seek in fandom. Granted, Crosby is an actress, not a psychologist and it stands to reason that her understanding and approach to fandom is going to be a fairly pedestrian one. (Which I don't mean as a slight in any capacity! As I said, she's not a psychologist and I wouldn't expect her to act/think like one.) But I know I made a deliberate attempt to bring some psychological and sociological theories into my book on comic fandom in an effort to dig a little deeper from a lay-person's perspective. It's still intended to be a relatively casual read -- certainly not an academic one -- but I wanted to probe deeper than, "You know, these comic fans are all pretty okay folks." So I would've liked to have seen some more of that in at least one of Crosby's two efforts. Ultimately, though, both movies were decidedly commercial efforts. I'm sure that's partially what led to so many interviews with the actors and producers of the shows. (Not that they overwhelm the footage of fans, mind you. And almost all of their anecdotes are fan-related. But I don't know that Kate Mulgrew's thoughts on the difference between "Trekkies" and "Trekkers" is really that significant even in this context.) As a more commercial endeavor, it's more likely to speak in broader terms. It's an entertaining piece and mildly informative. Anyone looking to study fandom (comics, sci-fi, or otherwise) might be able to pick up a few anecdotes of use here -- particularly among the fans that are interviewed in both movies -- but it's not a movie if you want a deep understanding of Trek culture. It's a nice summary, but you'll probably learn more reading Science Fiction Audiences.